Hi all! I'm Susi and I write as a guest blogger for Arcadian Lighting, a must-shop resource for beautiful light fixtures. My writing focuses on things I'm passionate about: interior design, home furnishings, gardening, travel, art and yes, crystal chandeliers. I get to look at gorgeous things all day and write about them. I'm a very lucky girl! Candice always has incredibly beautiful photos in her "Things that Make Me Smile" posts. I am thrilled and a little nervous to write a guest post this week of the things that make me smile. Since summer is in full swing now, I picked images depicting a nostalgic summertime of beach cabins and fireflies. I hope you enjoy them! Thanks for the opportunity, Candice! A romantic fairy tale bed outdoors makes me smile. Or at the very least, sleeping on a screened porch or with all the windows open on a cool night. 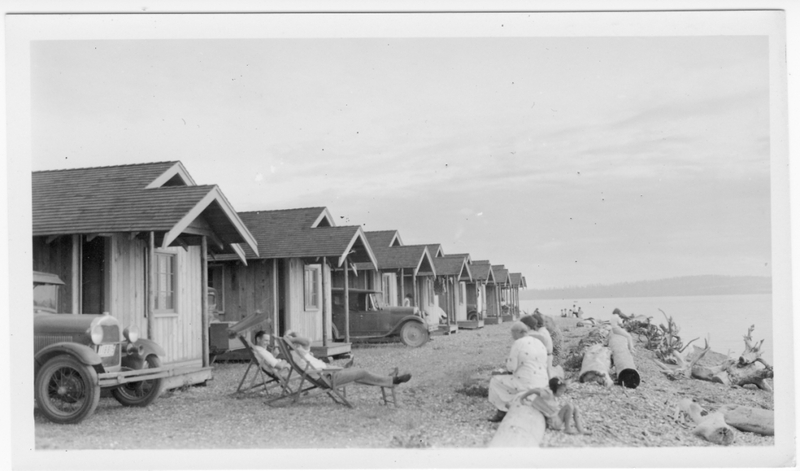 This vintage photograph of beachside cabins makes me smile. Why are the women all sitting on logs while the men lounge on the chairs?! Lovely white washed interiors of beachside cabins and cottages with their simple ceiling light fixtures make me smile and want to start planning an August seaside vacation. Summer crafts, like making long chains of shells and small driftwood, make me smile. Walking on the beach and collecting the supplies is the perfect way to spend a morning or afternoon. Fireflies make me smile. The brief yellow glow in summer twilight is magical. Reminds me of summers at a lake as a kid, catching fireflies in mason jars. Boys in preppy summer classics make me smile, as do classic colors and patterns like blue buffalo plaid, they just shout "It's summer!" Clam bakes or any seaside inspired meal makes me smile. A simple supper of grilled fish and grilled corn will do in a pinch. This photo makes me smile for so many reasons: my love of ice cream, vintage dresses and vintage photographs. She's so chic! Thank you so much for letting us have this wonderful opportunity! Have a fantastic weekend! We hoped you enjoyed it as much as we loved putting it together! Thank you for putting together such a wonderful post!